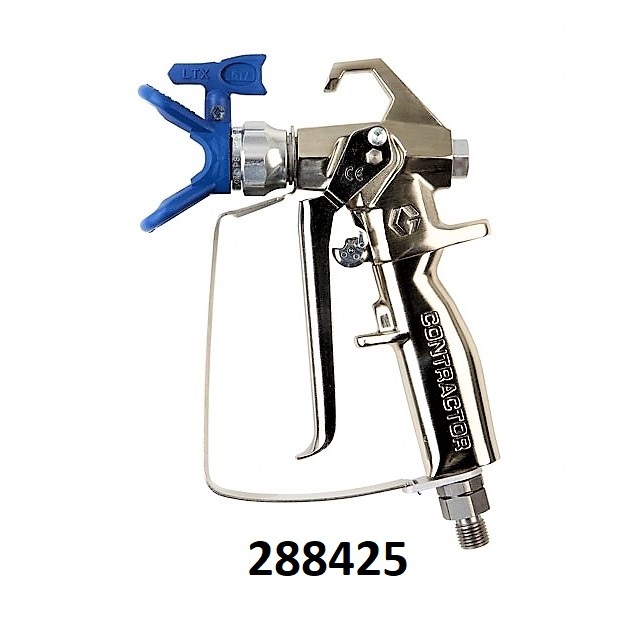 The Contractor and FTx guns from Graco are designed to be the longest lasting and most reliable airless spray guns, aimed to provide the maximum performance, reliability and comfort. The exclusive FlexSeal Needle design provides for longer life and maximum performance. The needle has no exposure to paint reducing wear, resulting in 70% longer needle life. The seat has been re-positioned closer to the tip, eliminating 60% "dead space" and reducing gun spitting. Lastly, the spring is outside of the fluid path to eliminate pack out and slow needle shut-off. Exclusive FlexSeal totally enclosed needle design (patent pending) - breakthrough needle design technology that protects the needle from paint, preventing wear and spitting. Modular needle cartridge makes these guns the easiest to service on the market - simply remove trigger cross pin and unthread front housing to change out needle. Contractor gun's form fitted handle provides maximum control and comfort. Durable nickel finish is corrosion resistant and easier to clean.